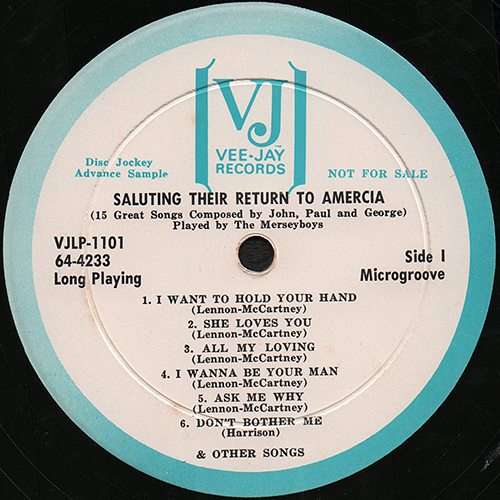 Vee-Jay Records #7 "The 15 Greatest Songs Of The Beatles"
Vee-Jay was founded in Gary, Indiana, in 1953 by Vivian Carter and James C. Bracken, a husband-and-wife team who used their initials for the label’s name. 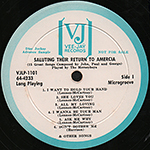 Vee-Jay had significant success with pop/rock and roll acts, notably the Four Seasons (their first non-black act) and the Beatles. Vee-Jay acquired the rights to some of the early Beatles recordings in a licensing deal with EMI, in which the main attraction at the time was another EMI performer, Frank Ifield. 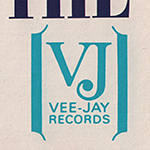 Vee-Jay's biggest successes occurred from 1962 to 1964, with the ascendancy of the Four Seasons and the distribution of early Beatles material. Go to "#1 Introducing The Beatles [Ver. 1]"
Go to "#2 Introducing The Beatles [Ver. 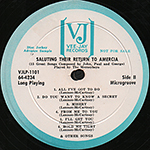 2]"
Go to "#3 The Beatles & Frank Ifield"
Go to "#4 Songs, Pictures and Stories Of ..."
Go to "#7 The 15 Greatest Songs"
Go to "United Artists Records"
The VJ brackets logo is right corner at the top of the cover above the title of the album. 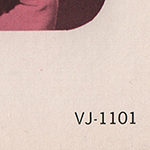 The catalogue number VJ-1101 is located in the lower right corner. 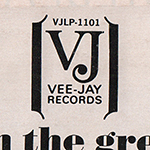 The VJ brackets logo in black is centered at the top of the back cover. White label with a large blue brackets logo and outer rim colorband in varying shades of blue. 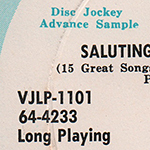 The phrase "Disc Jockey Advance Sample" and "NOT FOR SALE" is printed, both in blue print. 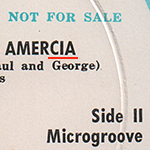 Misspelled "AMERICA" as "AMERCIA" on the label. 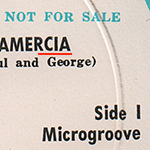 The words "Long Playing" and "Microgroove" appear on the label. On both sides, the label lists only 6 songs and has the phrase "& OTHER SONGS" at the bottom of the label. LABEL White label with a large blue brackets logo and outer rim colorband in varying shades of blue. COVER FORM Single type. Housed in a cardboard jacket. 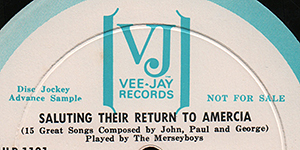 The album was not performed by the Beatles, but rather by the Merseyboys (*) from Birmingham. 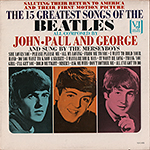 The cover to "The 15 Greatest Songs Of The Beatles" features large color tinted solo pictures of George, Paul, and John. The red print at the top of the cover procraims "SALUTING THEIR RETURN TO AMERICA AND THEIR FIRST MOTION PICTURE". 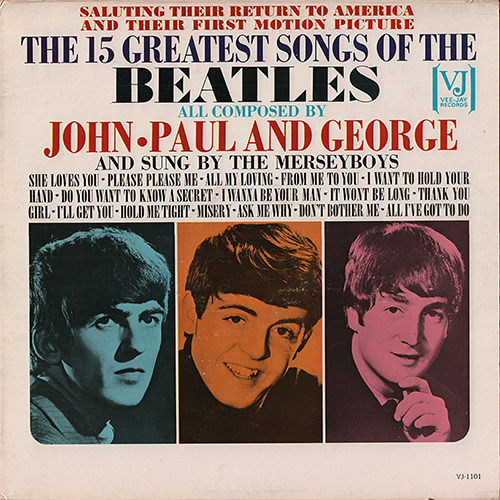 Large color type boasts "THE 15 GREATEST SONGS OF THE BEATLES". This is followed by "ALL COMPOSED BY" in small blue print above "JOHN . PAUL AND GEORGE" in large red print. 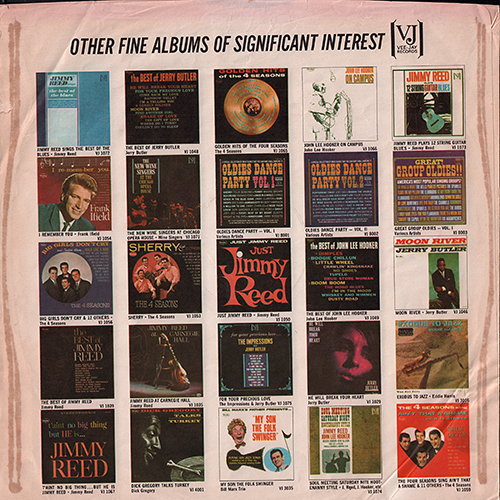 Squeezed in between this colorful information and a listing of the Beatles songs on the album is the phrase "AND SUNG BY THE MERSEYBOYS" in small black print. The back cover is even more deceptive as it makes absolutely no mention of the Merseyboys. 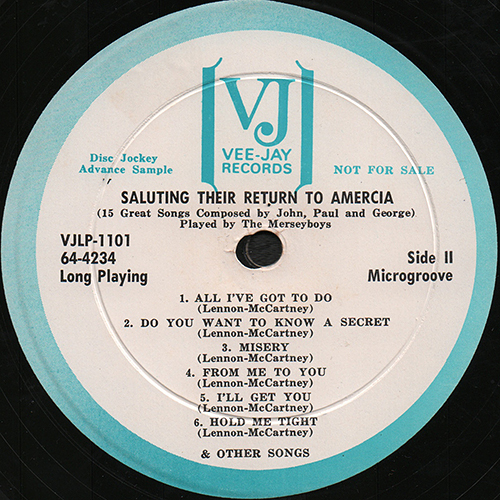 Except for the rare white label promotional copy of the interview record "Hear The Beatles Tell All", there are no known copies of promotional records for any of Vee-Jay's Beatles albums. 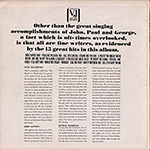 However, there are at least two variations of promotional records for "15 Greatest Songs". White label with a large blue brackets logo and outer rim colorband in varying shades of blue. 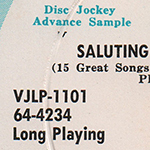 The phrase "Disc Jockey Advance Sample" is left of the brackes logo and the phrase "NOT FOR SALE" is to the right, both in blue print. The remaining information appears in black ink. Side I contains 7 songs, but the label lists only 6 songs and has the phrase "& OTHER SONGS" at the bottom of the label. Side II contains 8 songs, but the label lists only 6 songs and has the phrase "& OTHER SONGS" at the bottom of the label. It has an all white label with blue print featuring the brackets logo. Under the brackets and to the left is the word "Promotional" and to the right is the phrase "Not For Sale". The labels to this Monarch Records pressing list all of the song titles, which are left justified along with the songwriters credits. 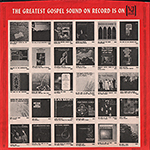 The stock copies of the record were pressed with label backdrops featuring the large brackets logo and outer rim colorband. Type-2) Pressed by Monarch Records. 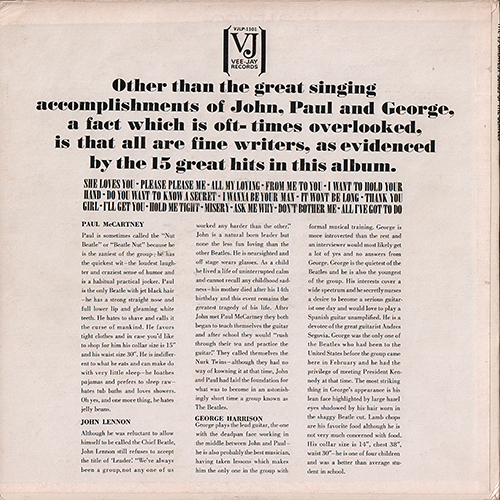 The labels to this variation list all of the song titles, which are left justified along with the songwriters credit. The Merseyboys were actually a group from Birmingham, England, originally known as the Plazents that featured lead singer Buddy Ash (Graham Ashford), Roger Hill on guitar and vocals, Graham Gallery on bass guitar and vocals, Paul Carter on saxophone and Dave Mountney on drums.